Spotify has twigged that some of its $14.99 Family Plan subscribers are not related but just good friends who’d prefer not to fork out $11.99 for individual deals. Subscribers in four markets have been sent emails asking them to confirm they all live at the same address through GPS data – or they’d lose the deal. By confirming, they get to continue their plan. But according to grumbles on social media: what happens if they share a family plan with a separated parent who lives elsewhere, or a sibling who lives abroad, or they spend a lot of time away from home? So far the US, Germany and two other unspecified countries are getting the emails, with others to follow. 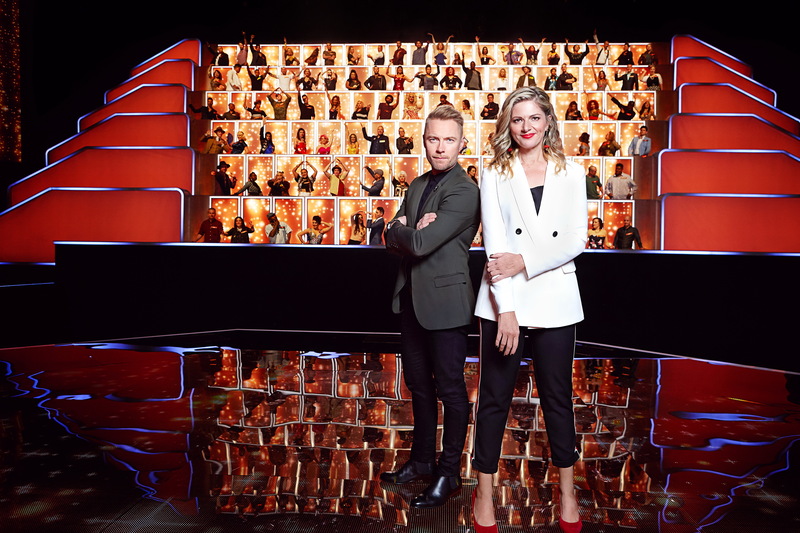 Channel 7’s new Julia Zemiro-hosted singing competition All Together Now, announced earlier in the year, premieres on Sunday (October 7) at 7pm. Based on the format of a BBC show, it has 100 contestants pushing and shoving (well, singing and dancing, actually) to get their mitts on $100,000 of prizes. Ronan Keating is on hand as “captain”, which is the same thing as what a “judge” and “coach” do on other singing reality TV shows. We bet he’s never steered a ship in his life. After Bauer Media’s celeb titles OK and NW pink-slipped eleven staffers recently, both have now lost their editors. OK’s Lucy Walker, who took the role only last year, is apparently leaving the business. NW’s Mark Brandon was in the hot seat for four years (“four consecutive periods of readership growth”) and says it’s now time to try something new. The last-minute changes in availability by some headliners saw promoters Hardware, Onelove and Live Nation decide not to proceed with the inaugural FestivalX this year – two months after the event was announced. It was supposed to be held through November and December taking in Brisbane, Melbourne and Sydney. “We set out to deliver the very best experience and the compromises to the proposed line-up did not meet the vision that we have for FestivalX,” they posted. Adelaide musician and academic Mark Keough has launched a new jazz club. It’s initially operating in Gilbert Street Hotel in the city but will in time find a permanent home. Keough is excited by the vibe of similar places like Melbourne’s Bennett’s’ Lane, Perth’s Ellingtons and the Brisbane Jazz Club where things are always classy and the unexpected happens. The first act was Sydney jazz saxplayer and singer Nic Jeffries who did a solo stint, stepping out of his current role as a touring member of Damien Leith’s band. Melbourne’s latest venue, Stay Gold, opens on Saturday night (October 6) in Brunswick, 13 Sydney Road. It is put together by the same team behind Brisbane’s The Brightside, Blackbear Lodge, Blutes Bar and Barbara as well as Good Things festival. Group director Jesse Barbera says,“We have been looking for a great space in Melbourne for years. With half our company based in Melbourne, it was one of our priorities. “When the opportunity came up to transform the Phoenix we took it immediately. Brunswick and greater Melbourne generally is one of the most supportive music communities in the world and we’re very excited to join it. While Coldplay’s manager says the band won’t be back on the road until “2021 at the earliest”, records from their touring company Flock Of Birds showed it turned over £63.6 million (A$114.9 million) with a profit of £38.4 million ($69.3 million) from their 63 A Head Full Of Dreams shows in 2017. The breakdown is: £59.1 million ($106.7 million) of performance fees and promotional support, plus £4.5 million ($8.1 million) in merchandise and royalties. Europe brought in £32.4 million ($58 million), while concerts in Asia gained £22 million ($39.7 million). For South America, that figure was £6.2 million ($11.2 million) and, in North America, they made £2.1 million ($3.7 million) from merchandising. That would mean that each of the five members were making £1,812.50 ($3,274.24) each hour! Star Entertainment Group has revamped its marketing team with four new senior hires. The company runs The Star Sydney, The Star Gold Coast and Brisbane’s Treasury Casino. Under chief marketing officer George Hughes are Melanie Luque as Star’s general manager for digital marketing; Anthony Cohen is general manager, brand, sponsorships and PR; and Marnie Darren joins in the newly created role of managing partner, Creative Agency. Longtime staff executive Shalon Lawler now becomes GM of commercial marketing for Queensland. After a year in Los Angeles making their Bloodhound album, Hobart duo Enola Fall head back to Australia to play The Great Huon and Mona Foma festivals. Joe Nuttall (guitars, keys and banjo) and Mark Woodward (bass) have been playing steadily during their stay, and invariably got into some adventures. One was going to a house party in Encino (San Fernando Valley) to see their friends The Knitts play, only to have the night finish with a shooting that left one person dead. At a faded 1940s West Hollywood called The Sunset Marquis where they met Morrissey‘s manager and taken to a secret basement studio (apparently built in the ‘60s so The Beatles could record there in privacy when they stayed there) where they whipped up some demos “with the most beautiful grand piano I’ve ever played,” says Nuttall. In New York, while playing The Delancey, it transpired there was ebola present in Manhattan, forcing some bars and bowling alleys to close temporarily. One of the affected places was the venue. The new epic single London, through Orchard/Sony, is on top of Industrial Strength’s playlist this week. WA police are investigating an armed robbery at the live music hosting Captain Stirling Hotel in Nedlands. Police say two staff members were standing outside the hotel after it closed. Two armed with faces covered forced them into the venue and made off with cash. The South Australian Tourism Commission is under fire for using music from young acts for a new Rewards Wonder campaign but initially wanting it for free, according to In Daily. The 60-second ad featured acts as The Germein Sisters and Rachel Leahcar and a five-day “live stream activation” using 120 hours of continual footage set to 100 songs from local artists. The tourism body appointed Music SA to approach bands with the offer. Music SA baulked at the terms and pushed for a payment of at least $150 each. According to In Daily, 15 acts went along initially for no fee (but received $150 after) while some like the band False Idols declined, calling the offer “exploitative”. A report from Deloitte shows that subscriptions to streaming services are rising in Australia –but not at the expense of pay TV. Of 2000 consumers aged 14—71 quizzed, 43% had a subscription in their household, compared to 32% in 2017. They watched 13.5 hours of streamed content in a week, with subscription video on demand (SVOD) taking up 28%. Most had two services to cover the content they were looking for. According to the survey, 89% used Netflix, with Stan at 26%, Foxtel Now at 23%, YouTube at 11% and Amazon Prime at 8%. Interestingly, pay TV remained stable at 31%, with sport cited as the main reason. Longtime Adelaide music venue Edinburgh Castle has closed for the time being as nearby construction closed off access to its street, making alcohol deliveries impossible. Melbourne composer Katy Abbott won the sole music fellowship of eight First Nations recipients of Australia Council Fellowships. Each is worth $80,000 and is offered for a year. Abbott’s compositions have been performed, published and recorded around the world, brought to life by many orchestras and chamber ensembles and performed in UK, Europe, Asia and the USA. She completed her PhD in 2007 including a guide to writing for the voice as her thesis. A while back, Mama Kin and Spender decided to join forces and become one. At the core of Mama Kin Spender’s project was the intention to tour around Australia, and to engage choirs everywhere they go. Said the release, “They want to sing with the unique voices of each place they visit and perform with local community choirs, for their own communities. “All you need is a community choir, or a desire to put one together. “Their own choir master will guide you through the process as you spend around 6 weeks teaching your choir the parts. “Then they will come to your town and do an extensive workshop/rehearsal, set up the local town hall, and make a little magic together! For any questions, email Mama Kin Spender at mkscallingallchoirs@gmail.com. Live Nation confirmed to this column that Childish Gambino’s Australian dates remain unaffected by the leg injury which saw him postpone his US shows. Amy Shark and her husband are rumouredly looking at buying a million-dollar home on the Glitter Strip, according to the Gold Coast Bulletin. Will.i.am insists he was not looking at his phone during Black Eyed Peas’ performance at the AFL Grand Final. Actor Shia LaBeouf ‘is dating’ singer FKA Twigs after splitting from wife Mia Goth. While a petition to keep EDM festival Defqon. 1 in Penrith, Sydney, raised over 18,500/ signatures, NSW premier Gladys Berejiklian’s threat to ban the festival because of its two deaths and high amount of patrons needing medical aid has been turned into a hardstyle banger called Shut This Down courtesy Sydney duo Twisted Melodiez and Melbourne-based N3bula. California governor Jerry Brown on the weekend signed new legislation that requires talent agencies to make educational materials on sexual harassment prevention, retaliation and reporting available to their clients. US director Cameron Crowe is turning Almost Famous into a musical. Serena Williams is raising another kind of racket: she’s recorded a version of The Divinyls’ I Touch Myself in an ad encouraging women to check for breast cancer. Vampire Weekend’s Ezra Koenig and Rashida Jones have welcomed a baby son. While Cher was entertaining Australian audiences, her house in Malibu California was being raided by police and the son of one of her assistants was arrested for a drug-related offence. Gold Coast band Eliza & The Delusionals’ new single Jackie was premiered via RSPCA Queensland. The track is about the death of singer Eliza Klatt’s pet dog and her coping with her grief. “Everyone experiences loss and I want this song to help people realise that they don’t suffer alone,” she said. Social media has slammed the antics of a group of men at the Deni Muster. One was pouring beer down the throat of a dead tawny frogmouth bird while his mates laughed hysterically as the funniest thing they’d ever seen. TV Tonight reported that filming of the latest series of Australian kids group Hi-5 in Malaysia has stopped after one cast member existed for personal reasons, and a Sydney production office has been relocated to Singapore.